PLEASE NOTE: There are two types of flexible vacuum/duct hose on this page: Type 190 and Type 195. Type 190 is thinner; it's about the thinnest, most flexible corrugated suction hose that will also support vacuums. Type 190 PVC suction hose has a slightly thicker wall and will support vacuum and moderate pressure. Some of these ducting hoses are availble by the foot. If you are looking for a braided version, be sure to check out this flexible suction hose today! Type 195 Heavy Duty Duct Hose & Moderate Pressure - Bottom half of the page. 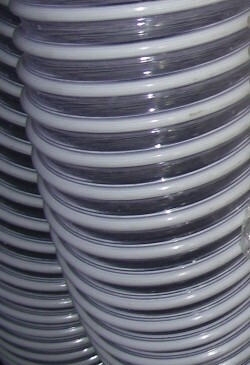 Sizes 2", 3", 4", 5" and 6" also available on Polyurethane for ducting abrasive materials. Please contact us. IN STOCK, Roll of 2" leaf/dust collection hose. Price is per 100' roll. 3" CLEAR PVC lawn, grass and leaf collection hose. Spiral Wound, Corrugated Exterior, Smooth Interior. Good for ducting, collecting and blowing light abrasives. Min. bend radius 4". Working pressure: 35psi, burst pressure 100psi.